Illustrious 96.4 Eagle Radio breakfast presenter and one of this year’s ugly sisters in the Yvonne Arnaud's production of Cinderella, Peter Gordon, will have help waking up his listeners in 2014 following the announcement that Seymours Independent Estate Agents will sponsor his breakfast show. The move by Seymours, which won the Award for Best Marketing and Presentation at the WSA Property Awards 2013 last month, is one of many sponsorship deals and community engagement programmes agreed by the estate agent for 2014. 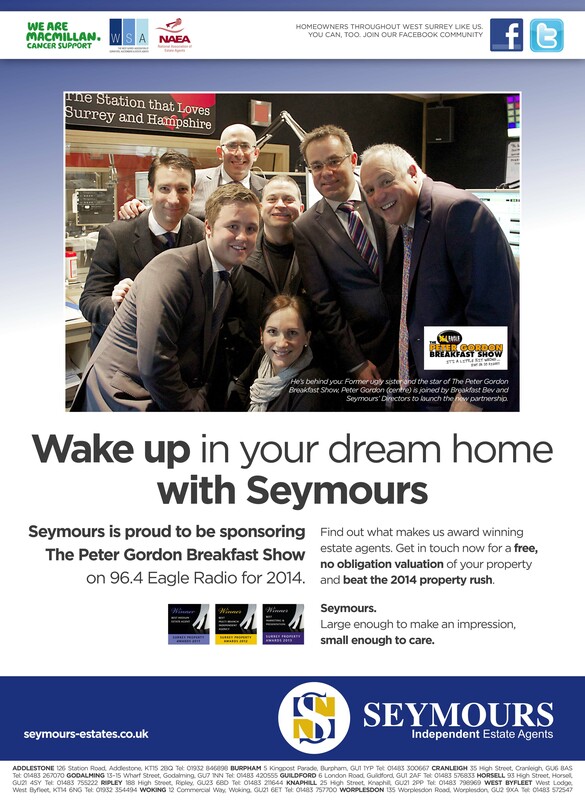 The partnership goes live this week and will see Seymours encourage 96.4 Eagle Radio listeners to ‘wake up in their dream home’ following the estate agent’s prediction that 2014 will be a good year for the property market.